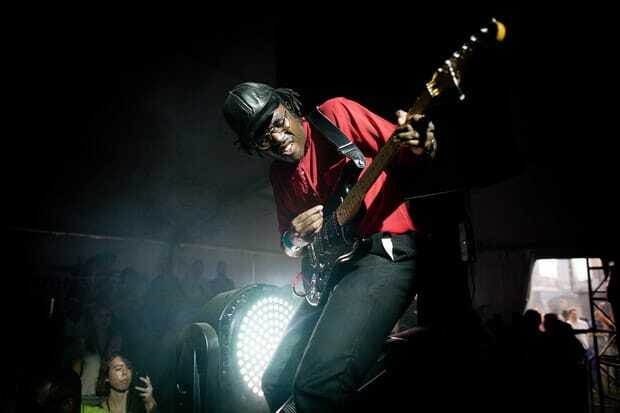 Blood Orange aka writer/producer/guitarist Dev Hynes has reworked "Entertainment," the lead single from Phoenix's upcoming LP Bankrupt!, out April 23rd. He cuts away at the grinning layers and adds in some rumpled, far-away guitar shred. The muted sampling of original drums, keys and kids chorus left behind are like blinking neons advertising to a vacant intersection. Mutya Keisha Siobhan—the reunited trio formerly known as Sugababes that recorded some tracks with Hynes a couple months ago in London—vamp the doubting I'd rather be alone chorus. Check out Dinosaur Jr.'s "Entertainment" remix, released last week, down there too, followed by the single's melodramatic, Korea-obsessed video. Download: Phoenix, "Entertainment (Blood Orange Remix)"
Download: Phoenix, "Entertainment (Dinosaur Jr. Remix)"